Remember my earlier postings about the lazy geek cushion and waterproofing your laptop? Everyone was wondering where to buy some of those great items. 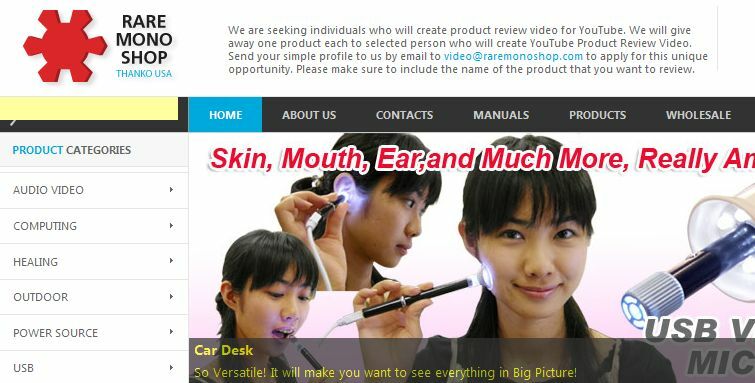 Well Thanko, the company behind those great inventions have opened and English website called Rare Mono Shop (Mono means “things”). They have a lot of great items at pretty reasonable prices. Rare Mono Shop has an introductory 5% discount coupon for the first 500 customers. Just use the coupon code: raremonoshop when you checkout. Havn’t you always wanted to own a USB eye warmer, a handheld USB microscope, MP4 watch, or a magic mirror webcam? Thought so. Check out Rare Mono Shop!